Barcelona is a modern, defiant, and creative city that for centuries warmly welcomed an illustrious group of artists, who bestowed their fame on the metropolis. Today, Barcelona is one of the most visited cities in Europe, besieged by thousands of tourists looking for the extravagant atmosphere of las Ramblas, the originality of Gaudí, or la Barceloneta. Despite these well-trodden paths, beyond the conventional tourist routes there lies a lesser-known Barcelona that offers even more genuine experiences. Away from the bustling atmosphere of the city lies Horta, a small district of Barcelona located steps from the Serra de Collserola, one of the largest urban parks in the world. Its privileged position between the city and an authentic green space historically made Horta one of the preferred summer sites for Catalonians of high society. Today, the nerve centre of Horta continues to be Plaza Ibiza, a tranquil space surrounded by authentic terraces that invite one to stop and enjoy the slow rhythm of this part of the city. The rustic enchantment of its rock fountain, old houses, and stately trees through which sunlight glimmers unite to give the area a magical touch. Losing yourself in the neighbouring side streets is a true delight for those who want to meet people and sample local traditions within a large city. Be sure not miss the old stately manors on Campoamor Street. The bucolic enchantment of Horta owes itself to the surrounding green areas. One of the most relaxing experiences is climbing the Turó de la Peira to enjoy the clean air of the pine forest and total calm while admiring views of the city. 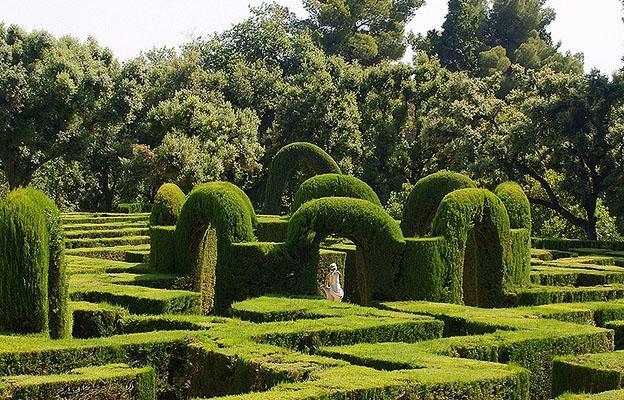 The true gem of this district, however, is Horta Labyrinth, situated in the oldest and one of the most beautiful parks in Barcelona. Famous for having been the backdrop for the film “Pan’s Labyrinth,” the framework of trees offers a fantasy world decorated with small temples and statues of gods. In addition to the labyrinth, the gardens mix neoclassic style with romantic details. An elegant staircase, a stream crossed by a pretty stone bridge, and a pool inviting you to relax are the perfect details to complement your visit. Horta will surprise you with its nightly cultural offerings. In fact, the fame of some of its locales attracts those who live right in the centre of Barcelona. Such is the case of the emblematic Louise se Va, a place with intimate and authentic decoration where one can listen to old as well as new hits by independent artists. Those looking to dance have the exotic Samba Brasil at their disposal. Moving to the rhythm of the samba is simple once you have enjoyed a couple of perfectly made caipirinhas. Away from the crowded dance floor, its outside patio is ideal for talking or taking a break. On the Internet you can find endless offers for inexpensive flights and accommodations in Barcelona so you can visit during your next free weekend or short holiday and discover more facets of this fascinating city.